The first trailer for "Lawless," starring Tom Hardy and Shia LaBeouf as Depression Era bootlegging brothers, has arrived, bringing with it the hopes of a gangster epic. 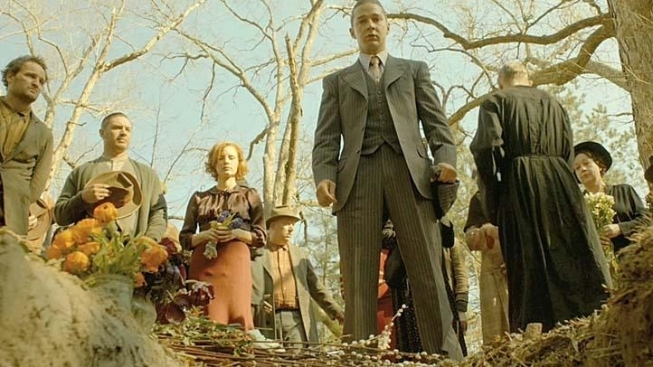 Directed by John Hillcoat and written by Nick Cave, the film also features one of the year's best supporting casts, including Jessica Chastain, Guy Pearce, Gary Oldman and Mia Wasikowska. "Lawless" is based on Matt Bondurant's "The Wettest County in The World," a historical novel inspired by the real-life exploits of Bondurant's grandfather and two granduncles, and their involvement in the Great Franklin County Moonshine Conspiracy, which held a corner of Virginia in its grip for much of the '20s and '30s. We remain unmoved by LaBeouf's charms, and find the idea that he gets top-billing in a film featuring some of the bet actors in Hollywood a little silly. Pearce's effete sociopath lawman, Oldman's cigar- and scenery chomping mob boss, and Hardy's backwoods Capone all crackle, while LaBeouf shifts between wide-eyed and faux angry. But we have total faith in Hillcoat and Cave, who previously worked together on "The Proposition," one of the very best westerns of the past decade. The two blend complicated characters, deliberate plotting and an unflinching approach to violence that makes for great cinema.